I love Christmas so much. I love creating things for Christmas and decorating my house. One of my favorite ways to add a pop of festivity to my space is to add in holiday throw pillows. 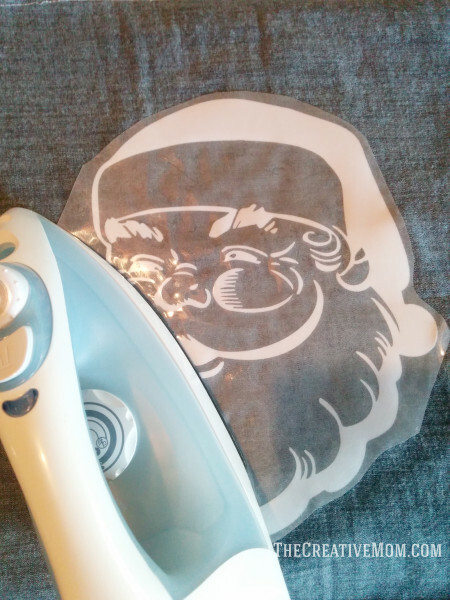 So, when I was challenged by Silhouette to use their Heat Transfer Material, I knew I wanted to do a DIY Santa Pillow. And I think it turned out darling! It is just the right amount of vintage and festive… perfect! 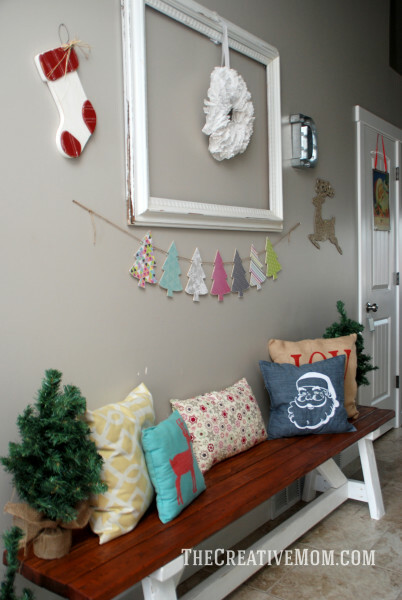 I love the way this pillow looks in my entryway with my Christmas Tree Pennant, my doily wreath, and my DIY Farmhouse Bench. 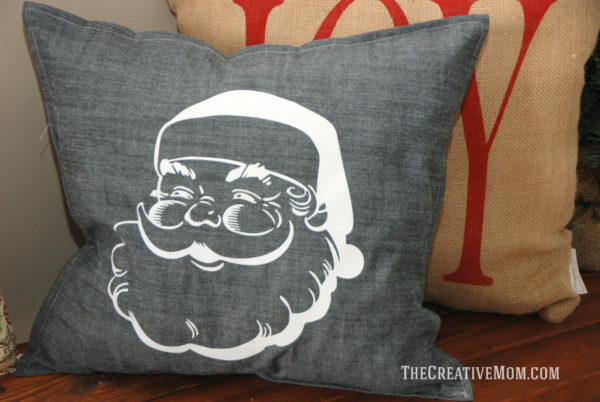 This Santa pillow reminds me of classic Christmases growing up. It just really makes this space look great for the Holidays. 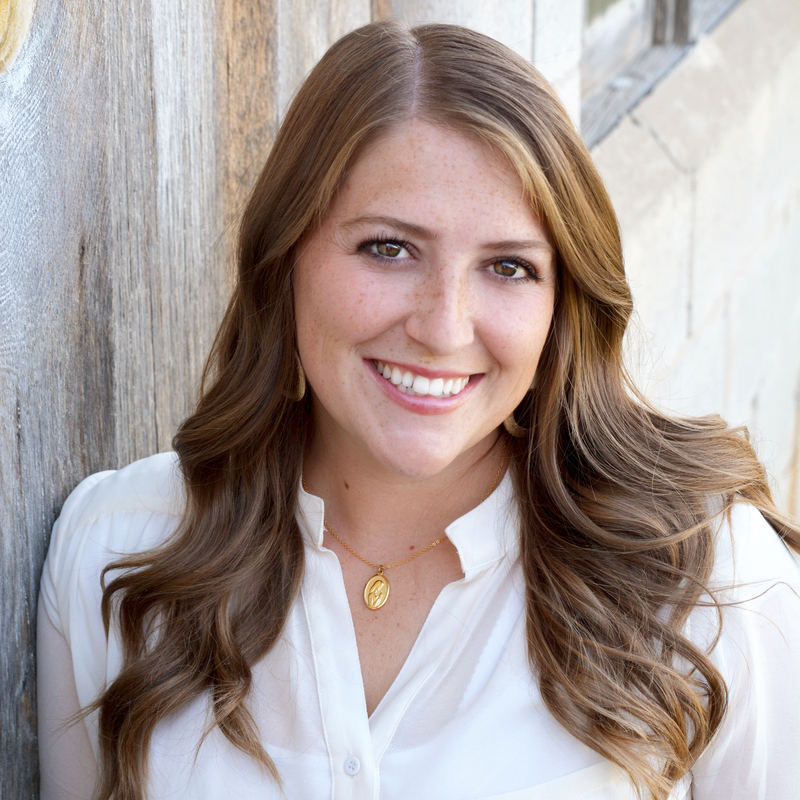 Would you like to make your own heat transfer pillow? Here’s how. Start by setting your image up in Silhouette Studio. 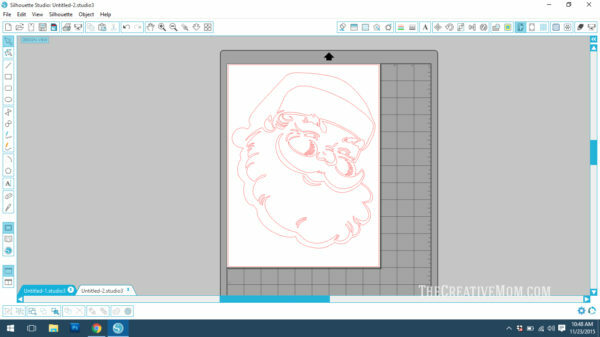 I purchased this Santa from the Silhouette store for 99 cents, but you can use any image you’d like. 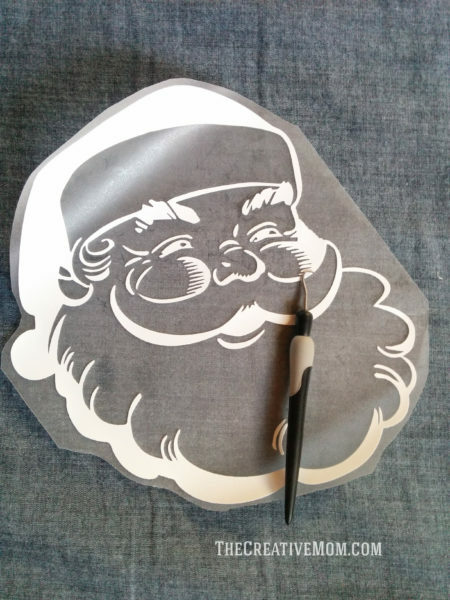 Cut your image out of heat transfer material. 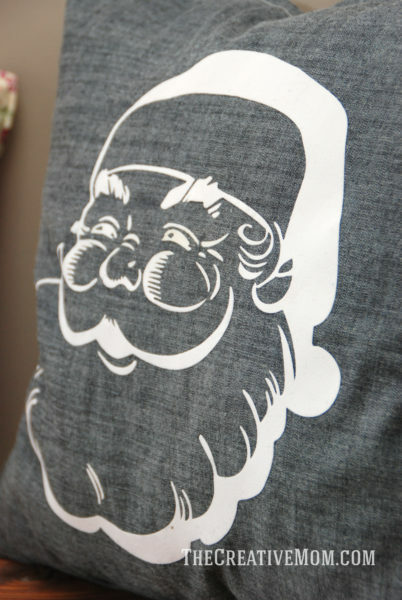 You’ll want the glossy side down on your mat, and the heat transfer side up (or cut without a mat). Remember your image will be flipped once you iron it on, so if you have any words or anything, be sure to reverse your image before you cut it. Weed out all of the negative space. Basically, you just take off all the parts you don’t want on your pillow. I love this handy hook to get those hard to remove pieces (it comes in the Silhouette Heat Transfer Starter Kit ) . Be sure to leave your heat transfer material on plastic backing, that’s what keeps your image straight and together. Then place your heat transfer material on your pillow cover, and iron over the plastic. I made sure to iron my fabric first, so it’s nice and hot before I placed my image. Then I ironed right on top of the plastic. You can place a thin piece of fabric on top of your plastic if you’re worried about it melting. 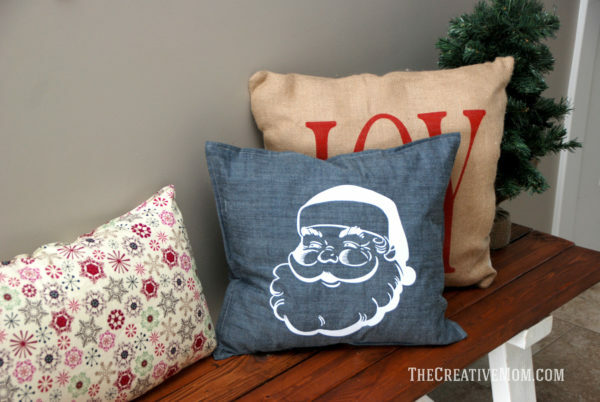 And watch as people swoon over your DIY Santa pillow all season long! If you are wanting a Silhouette cutting machine, you can find really GREAT DEALS on Amazon right now. 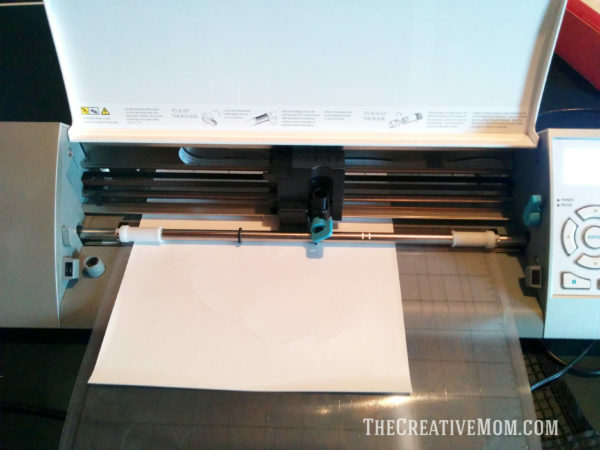 I would really recommend this Silhouette Cameo Bundle and the Silhouette Heat Transfer Starter Kit . If you’ve never used heat transfer material before, this kit will get you started.